Paraguay is a small country sandwiched between the giants of South America. It is overlooked both by travellers and by conservationists. It is a country just a bit bigger than Japan, with 1/20th its population. In the past century, Paraguay has been at war with every single one of its neighbouring nations. Historically, it has consistently been a poor and underdeveloped nation that no one considered - located in the precise centre of the continent, Paraguay is the forgotten corner of South America. However, despite its small stature and tumultuous past, it is home to three of the most important biomes in South America: the Atlantic Forest, the Cerrado, and the Gran Chaco Plain. While the country's economic and political structure has grown in recent years, these natural habitats have suffered greatly. Due to the widespread industrial and agricultural development, each of these incredible ecosystems is being systematically destroyed. The Atlantic Forest boasts a biodiversity rivaling that of the Amazon and is recognized by Conservation International as a "biodiversity hotspot." It is home to over 11,000 threatened plant species and once covered a range the size of South Africa. Today only 7% of that original area remains. The Cerrado, also a "biodiversity hotspot," is the most biologically rich savannah in the world, boasting a larger biodiversity than the famous African Serengeti. It covers nearly a third of Brazil's land mass but has become under greater threat since the Brazilian government introduced restrictions on purchasing land in the Amazon basin. Only 5% of the Cerrado biome is under formal protection, most of which is located in a few massive chunks that are too large for reserve managers to properly protect and so regularly fall prey to poachers and illegal loggers. The Gran Chaco Plain is the least famous of the three habitats but the one that is in need of the most immediate help. Due to advancements in agricultural technologies, land that was once considered too arid for planting has now become the perfect place for soy and switchgrass plantations. Huge tracts of land are being purchased by large agricultural companies at cheap prices and being transformed. In 2012 alone, 10% of Paraguay's Chaco was purchased, burnt and converted to agriculture. This trend does not appear to be slowing on its own. The situation in Paraguay is ominous but there are people and organizations fighting to reverse this trend. Para La Tierra (PLT) is one of them. PLT is the small not-for-profit conservation organization I work for, dedicated to the protection of all of Paraguay's threatened habitats. It was founded by Scottish national Karina Atkinson in 2010 after her first visit to Paraguay as an eco-tourist in 2008 when she lived and worked on a large nature reserve in the south of the country. It was there that she fell in love with the nation's amazing wildlife and witnessed first-hand how quickly their natural habitat was disappearing. As she passed mile and mile of cattle ranch on her six hour bus-ride from the reserve back to the capital city, she vowed that she would come back and make a difference. Two years later, after raising money and awareness among her friends and family in Scotland, she successfully founded Para La Tierra - an organization whose sole purpose is the conservation of natural ecosystems in Paraguay. Since that day, Para La Tierra has never wearied of its task. Through scientific research, community outreach, and environmental education, we are committed to fostering a long lasting change in how Paraguayan natural habitats are perceived both at a national and international level. We hold regular workshops on reserves and in classrooms, teaching Paraguayans about the importance of their local fauna and what they can do to help stop it. We have welcomed over 200 students and professionals from around the world to our field site to conduct research. We offer much needed field experience and scientific training to the next generation of conservation biologists. We have created the country's largest single site museum collection that they use to inspire a love for the amazing biodiversity their country has to offer. As a conservation organization, we also work at the species level. 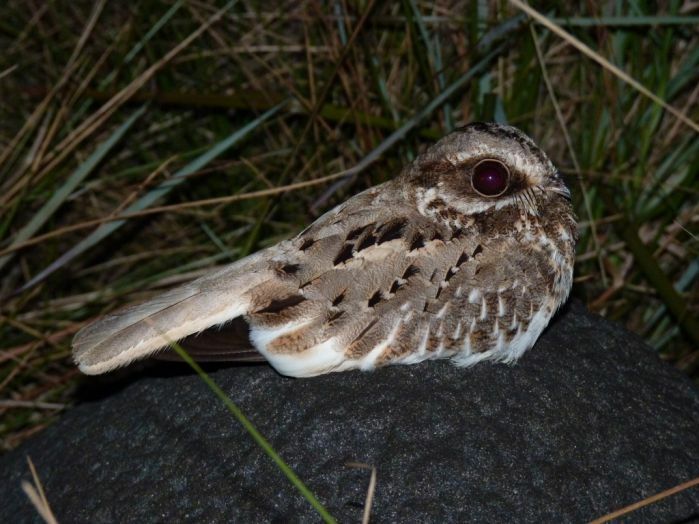 Our logo, and flagship species, is the White-winged Nightjar, Eleothreptus candicans, an endangered Cerrado endemic that is known only to breed in three locations in the whole world. With an estimated population of less than 2,500 (IUCN), the population that we work with is of utmost importance to the survival of the species. Our on-site scientists have been working with the land-use managers to ensure the continued protection of this incredibly beautiful and incredibly threatened species. To date, our work has focused exclusively on the Atlantic Forest and Cerrado habitats. However, thanks to the prestigious Rolex Award for Enterprise that Karina Atkinson won for her incredible conservation work, we have begun an expansion into the Gran Chaco. The award recognized Para La Tierra as a standard for conservation organizations everywhere and a sustainable model that could (and should) be transplanted to new sites across the country. The funds of the award have gone a long way to helping Para La Tierra expand to conserve other threatened habitats in Paraguay but to cover additional expenses, Para La Tierra is currently running a crowd-funded campaign on Indiegogo.com that ends on the 2nd of July. We know that there will never be a silver bullet solution to conservation, which is why we are doing everything we can to combat the degradation of habitat at every single level we can - but we need your help! If you want to contribute to their cause or simply find out more information, please visit our page and share it with your friends and family. If you are a young scientist looking for field work experience, a professional scientist itching to get back into the field or just someone who loves wildlife, or find out how you can get involved directly with Para La Tierra.